You can easily create a functional and comfortable outdoor space at home. Trendy bistro sets for the garden or balcony create a pleasant look. Parasols and gazebos add to the cosy atmosphere. 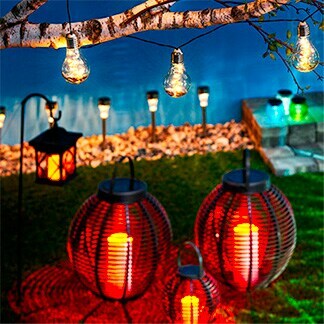 Don't forget the little extras such as plants, garden decorations, textiles and lanterns which make an impact. Put down some deck tiles for a new look, which is an easy and cheap way to renovate your balcony. Sometimes the small details and projects are enough to make a big difference and it does not have to be too expensive. Visit our stores and check out our large range of products for outdoor living. Metal garden arch. Shabby-chic white. Brown oiled acacia. Foldable. Equipped with anti-pinch safety catch. Artificial bamboo plant in a pot. Height: 122cm. Perfect for accommodating plants, tea lights, etc.